A most important consideration. If your floors require maximum protection, select a resilient wheel. If you desire capacity only, choose a metal wheel. If you want capacity and floor protection, we recommend a Plexite and/or Polyurethane wheel. Are there metal chips? Harsh chemicals? Uneven surfaces? Elevator sills? Extreme heat or cold? If so, a metal wheel may be your best bet. 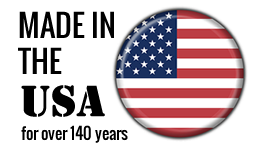 For a complete review, please see our Wheel Selection. 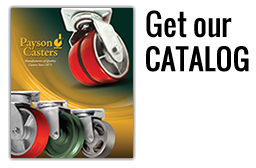 We believe that it is wise to select “more caster than you think you need.” Payson is a member of the Institute of Caster Manufacturers and subscribes to virtually all of its suggested load ratings. Each load rating is based upon a manual operation of 3 to 5 mph over even floors. Your selection should have a large enough wheel to ride over obstructions smoothly and to transport the load with minimum effort. Although anti-friction Roller, Ball and Timken bearings don’t necessarily increase the capacity, they make it easier to start and sustain motion. In addition, they are quieter. Plain, Delrin, or Oilite bearings should be considered when the operation is intermittent and when the travel is short. Each Payson caster is constructed with precise quality, prelubricated and thoroughly inspected before it leaves our factory. Casters should be relubricated on a regular schedule, and nuts and bolts should be kept tight. If the caster is used constantly, it should be checked once a week. If used only intermittently, then once a month. The distance measured horizontally from the center of the kingpin to the trailing edge of the wheel. 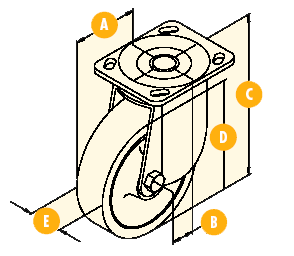 The horizontal distance from the center of the kingpin to the center of the axle. The vertical distance from the floor to the top of the mounting plate.